Narva is certainly a town thats quite different from the other Estonian towns. Many of the appartmentblocks look the same and a bit dull and grey.. and yet the town does have a certain charm because it's so different. It's worth to visit for 1 or 2 nights.. after visiting many cities in Estonia I wouldn't have wanted to do without it. The hotel is located in an area with dull grey apartmentblocks... there is a mall at walking distance and the hotel offers free car park. The room was quite large, but very basic in furniture and decoration. The bathroom was a bit on the small side but clean. The hotel stands out in this area because it's looks shiney and new compared to the surroundings. The staff was "ok".. the ones doing the breakfast did their job, but don't expect much of a smile. The reception was more friendly. I don't think the people were unfriendly, maybe more just a bit introvert, as Estonians sometimes tend to be. 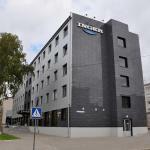 I would stay in this hotel again if I would be back in Narva.